From December 5 to December 20 2013 , Gordon Matta-Clark’s concept of Anarchitecture, as well as his communitarian spirit as expressed in the artist-run restaurant FOOD, will be explored and reanimated in a disused lighting warehouse in Warren Street in London’s Fitzrovia. Anarch Gallery have taken over the space and have invited a range of different artists to undertake short residencies within the framework provided by a large-scale structure created by Andrew T. Cross, that will rise up from the basement to the first floor of the building. On the evening of 12 December I will be hosting an in-conversation with Paris-based artist and musician Ramuntcho Matta, Gordon Matta-Clark’s half-brother. After our talk the artist Hector Cassals will be serving paella. You can learn more in the press release below. After a successful residence for over a year in Deptford, Anarch is roaming and will be occupying 14 Warren Street for Colony, a 16 day programme with daily events by multiple collaborators. 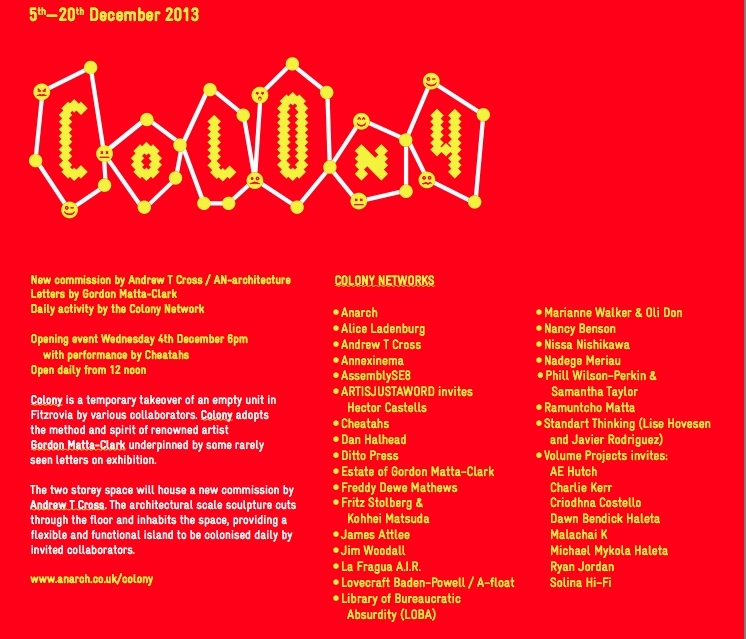 Colony is a temporary takeover of an empty retail unit in the affluent Fitzrovia area of central London. Colony explores the spirit of renowned artist Gordon Matta-Clark underpinned by a small selection of his rarely seen letters on exhibition for the duration. These letters serve as reminders of his character, determination, confidence, sense of humour, and open-armed, forward-thinking method of working that motivates the Colony initiative. The two storey space will house a new Anarch commission from artist Andrew T Cross / AN-architecture. The architecturally scaled sculpture cuts through the gallery floor, coming up from the basement to occupy the showroom. The large structure, made of reclaimed wood, will inhabit the vacant unit and provide a flexible island to be colonized daily by an invited network of multidisciplinary artists and practitioners: Colony Network. This structure will function variously as studio, seminar / conversation space, performance platform, FOOD restaurant, gallery and as a stand-alone piece of public, urban sculpture. Colony is a node in the city where a temporary community, Colony Network, will gather together and create a dynamic, chaotic and fun programme on, in and around the functional installation. The opening reception is on Wednesday 4th December, 6pm where the daily programme of events will be launched with an epic performance, XI, presented by Cheatahs throughout the space. Paying homage to Ryhs Chatham’s Guitar Trio and the No Wave movement, “XI” is a one off avant-garde work for 11 guitars. Taking a guitar drone in the key of D as a starting point, the 11 players – made up of members of Cheatahs and fellow London bands Mazes, Male Bonding, Great Ytene, Novella and Omi Palone – will each take it in turn to improvise and explore tonal possibilities within the drone. ATC has created large-scale commissions with Secret Arts, Aid & Abet, Artspace, London Pleasure Gardens. Anarch director Jude Bennett and ATC have been in conversations for years around the various concepts that are touched on through Colony. This project is the basis of realising future collaborative projects between them. Gordon Matta-Clark (1943 – 1978) is widely considered one of the most influential artists working in the 1970s and a key figure in the growth of New York’s downtown art scene. He is renowned for his building cuts, his collaborative projects like FOOD restaurant and for evolving the concept of ‘anarchitecture’. At colony, FOOD is an open event where Network participants ‘in residence’ will host an informal meal and artist talk to offer opportunities for collaborations and exchange. Anarch is a commissioning agency led by curator and collaborator, Jude Bennett, with the aim of taking an open and supportive approach with emerging and established artists. Jude Bennett, Director / Collaborator. Image credits: (Left) Letter to Lee Jr, August 1 1971, Gordon Matta-Clark 1975. (Right) Temple, Andrew T Cross (previous commission by secret arts 2013.